Hypertonic saline is a type of fluid that is often used forintravenous (IV) therapy. This means that it is infused directly to a vein for medical purposes such as correcting fluid and electrolyte imbalances or dehydration. 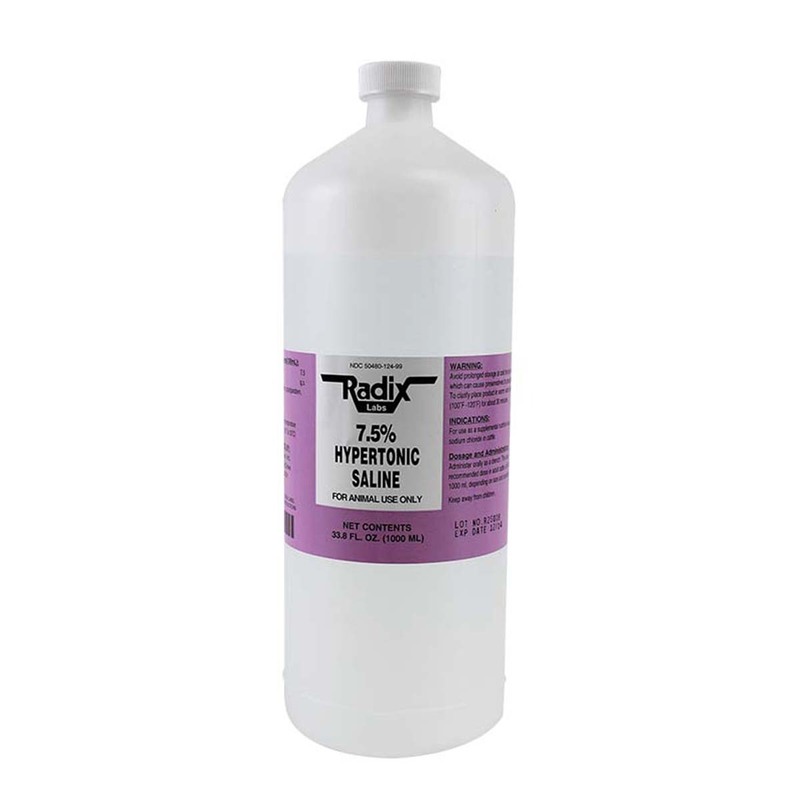 The most commonly used IV fluid is normal saline, which is a sodium chloride (NaCl) solution at 0.9% concentration. This solution is isotonic, or close to the concentration of sodium chloride in the blood. In contrast, hypertonic salinerefers to saline solution that has a much higher sodium chloride concentration than physiologic (normal) levels. There are different preparations of this IV fluid, including 2% saline, 3%saline, 5%saline, 7%saline, and 23% saline solutions. NaCl 3% and 5% NaCl are most commonly used preparations. These fluid and electrolyte replenishers are available in single dose containers for IV administration. Hypertonic saline is used only for special medical indications. One of these is to increase sodium (Na+) levels in the blood in cases of severe hyponatremia (low sodium levels), which may be associated with brain swelling or cerebral edema. Brain swelling can lead to an increase in intracranial pressure (the pressure inside the skull), which can further cause brain damage. Infusion of hypertonic saline can help reduce cerebral edema and prevent the progressive increase in intracranial pressure. Other conditions where hypertonic saline solutions like 3%saline may be used include those that involve large losses of sodium from the body through the gastrointestinal tract. Compared to other types of hypertonic IV fluids like mannitol, hypertonic saline solutions like NaCl 3% are cheap, easily available, andless likely to cause hypovolemia (excessive blood volume reduction). It has a rapid onset of action with peak effect at 10 minutes and duration of one hour. It therefore helps in the rapid restoration of blood volume, improvement of blood pressure and reduction of intracranial pressure. Aside from thesehemodynamic effects, studies show that hypertonic saline has anti-inflammatory, neuroprotective, and immunological properties that can help reduce multiple organ dysfunction syndromeandpost-traumatic lung injury. Since hypertonic saline solutions like 3% saline or 5% saline contain a much higher concentration of sodium than that of blood, its use is limited to hospital use. The usage of it must be closely monitored since it can have serious side effects. Adverse reactions may occur as a result of using hypertonic saline either due to the effects of the solution itself or due to improper technique of IV administration. Fever, infection and inflammation of the vein (phlebitis) may occur due to spillage of hypertonic saline outside the vein to the surrounding tissues (extravasation). Infusion of large volumes of hypertonic solutions can also lead to hypervolemia or excessive blood volumes, which may result in life-threatening complications such as seizures, rebound intracranial hypertension or kidney failure. It can also lead to hypernatremia or high sodium levels in the blood, or hypokalemia or very low potassium levels. Infusion of hypertonic saline must be immediately discontinued if any of these adverse effects occur. The patient must be immediately evaluated and appropriate treatments instituted to prevent further complications. Besides the side effects of hypertonic saline, there are some precautions of using it that you should know. Hypertonic saline may be used only if clearly needed in pregnant women, babies, children, and elderly individuals aged 65 or over. Doctors must use proper doses and closely monitor its effects. Hypertonic saline solutions should not be administered if the solution is not clear or the seal is not intact.